Stiga Battery Harness for use with the Voltage80 4Ah and 5Ah Lithium-Ion batteries. 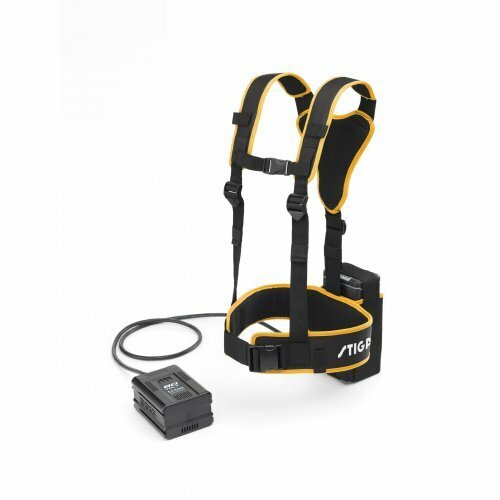 The harness holds the battery comfortably against the user's lower back and connects into the battery slot on the cordless tool with a flexible cable and adaptor. Removing the battery weight from the tool makes it extremely easy to use and ideal when working over extended periods. At the heart of the Stiga 80V range, are our class-leading 80V Lithium-Ion batteries. With lightweight, high performance cells delivering long running times, they have no memory effect - so the power doesn't fade in use - allowing you to work over long periods, just as you would with a petrol-powered tool.